1. Descriptive of a person who has a kind and gentle disposition or appearance: Jim's benign and friendly countenance belied his stern personality and mannerisms. 2. Referring to a disorder which is not a threat to life or long-term health; especially, by being noncancerous: Dr. Anderson, the plastic surgeon, removed a benign, or harmless, growth from the side of Carol’s nose. 3. Pertaining to something which is neutral or harmless in its effect or influence and does not threaten one's health or life: Although benign forgetfulness is an inability to immediately remember a name or a date, the item is usually recalled in a short time. Medical placebos are intended to have a benign effect on patients during medical research trials and experiments. 4. Relating to a condition which is mild or favorable in effect: Jack's family enjoyed their vacation at the lake because there was such a benign climate there. 5. A reference to a situation which is favorable for a recovery with appropriate management: The finance minister attempted to reassure voters that the economy was in a benign status and would improve soon. 6. 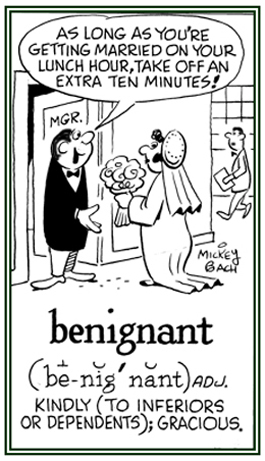 Etymology: from Old French benigne, from Latin benignus, "good, kind"; literally, "well born", from bene, "well" + gignere, "to bear, to beget", from genus, "birth". © ALL rights are reserved. 1. Conveying kindness and graciousness in behavior or appearance: The actress, despite her fame, always displayed a benignant attitude towards her fans. 2. Relating to a favorable and desirable situation: There was a warm and benignant breeze blowing up from the river during the afternoon. 3. Descriptive of the kind and courteous behavior of a ruler towards his or her subjects: Once on the throne, the king, who had been young and foolish, was soon beloved by his subjects because of his benignant goodwill towards everyone. © ALL rights are reserved. 1. Relating to a kindness and gentleness of attitude and appearance: No one would call the actress particularly beautiful, but most people would agree that there is a benignity regarding her appearance that enhances her charm and fascinates all of those who associate with her. 2. A kind or gracious act: After a stressful week, Mrs. Challace, the famed lawyer, enjoyed being home and receiving many benignities from her family; all of whom helped her relax and forget the burdens related to her profession. Relating to a mild type or characteristic that does not threaten health or life; harmless and inoffensive: The police officer benignly smiled at the motorist as he drove up next to the car while the driver was waiting for the traffic light to turn green. 1. A blessing or an expression of good wishes : The president of the theological seminary asked one of the professors, Mr. Jones, to give the benison at the end of the graduation ceremony. 2. 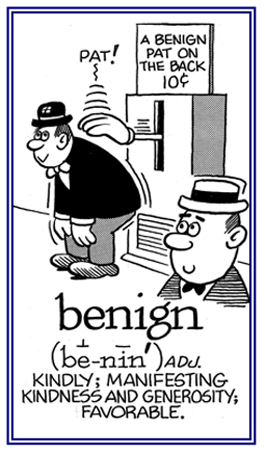 Etymology: from Middle English, which came from Old French beneison; from Latin benedictio, "praising". Melius bene imperare quam imperium ampliare. Translation: "It is more important to reign the empire well than to increase it." Motto of King Rudolf of Habsburg, Germany (1273-1291). Note well or Take careful note; Take notice. Universal generosity, kindness, acts of charity or support for all, without prejudice: There are some nongovernmental organizations in poor countries which are acting under a mandate of omnibenevolence by extending their help to everyone possible. A reference to showing goodwill, kindness, and charitableness for all people: Food was being distributed as an omnibenevolent gift to all of the flood victims. Translation: "Where ever we are content, that is our country." A motto by Marcus Pacuvilus (c. 220 - c. 130 B.C.) who wrote fourteen plays and a satire. Only fragments of the plays survive. Translation: "For the benefit of the world." Translation: "The important thing is not how long you live, but how well you live." Translation: "I owe my allegiance to the country in which I prosper." Related good-word units: agatho-, bon-, eu-. Word groups which are antonyms of this unit: caco-, dys-, mal-, mis-. Showing page 3 out of 3 pages of 45 main-word entries or main-word-entry groups.